The Highline Spritzer comes from mixologist Jon Howard at The Fillmore Room, and features white tequila with some fruity and lightly floral flavors. This cocktail was inspired by the New York City’s High Line public park, and designed for warm days and drinking outside. In which case you might want to use a mason jar glass rather than a wine glass. The prosecco is what makes it a spritzer. If you’ve never had lavender in a food or drink before, you might be surprised to discover how it performs in recipes. Instead of tasting the way lavender smells, it takes on an almost undefinable character that’s not quite floral, not quite herbal. It has a clean, almost mint-like taste. 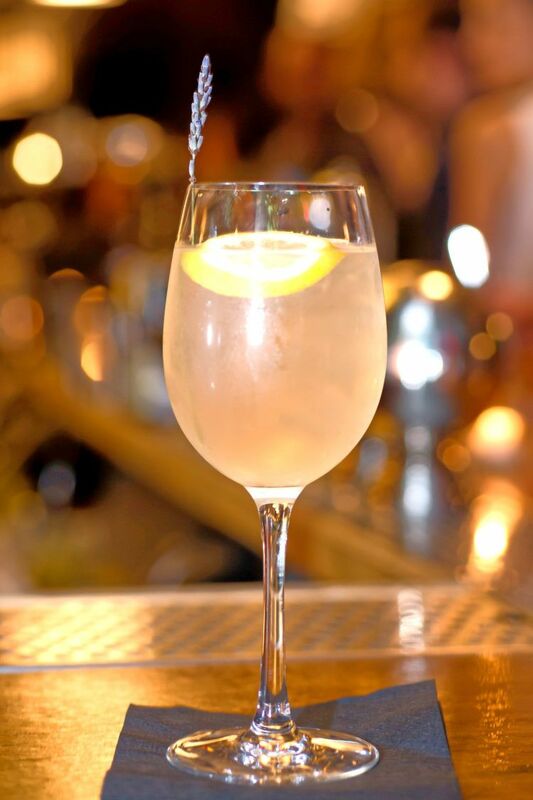 And with the lemon juice and the citrus notes from the Lillet and the prosecco, the overall flavor is clean and vibrant. And lavender syrup brings out the other flavors, reinforcing the whole spring motif of this cocktail. This is a refreshing cocktail with a light feel. It’s perfect for an outdoor lunch on a sunny day, or as a late afternoon pick me up before an evening out. If you’re thinking of serving this drink with a dessert, try this Lavender Cake with Lavender Cream Cheese Icing from Savor the Best. The carefully balanced lavender flavors in the drink and the cake should complement each other very nicely. If you want to have it with a meal, this Foil Baked Salmon from Primavera Kitchen is flavored with lemon, onion and oregano, which pair very well with the notes in the cocktail. Fill a cocktail shaker halfway with ice. Pour in all the ingredients. Shake well, and strain into a wine glass. Garnish with a lemon wheel and lavender sprig.